Experience the incredible adrenaline rush of white water rafting during this awesome private charter experience! Test your nerves as you bump and glide your way down the rapids - great fun! Put your nerves to the test with this awesome white water rafting private charter in Northampton, where you will experience an unforgettable and adrenalin filled thrill! In your own private raft (which holds up to 6 people) you can ride the river rapids and see why white water rafting has earned itself the reputation of being one of the most extreme of all extreme sports! You can work with your team to bump and float your way along the rivers, whilst the rapids will make sure your adrenalin levels never dip! All you need to bring along is a sense of adventure as you have the ride of your life!Your experience starts with a briefing about safety and white water rafting techniques, then it's on with your safety gear and you're off, as your qualified guide takes you and your fellow rafters down a varied white water run in an inflatable six man raft. You may get more than one run dependent on conditions and time. Each boat is guided by an expert instructor. Rafting is available all year round. Seven days a week during peak season (June to Sept) and on a supply and demand basis during the other months. The normal rafting season is starting on the 7th April 2018 through to October 2018. 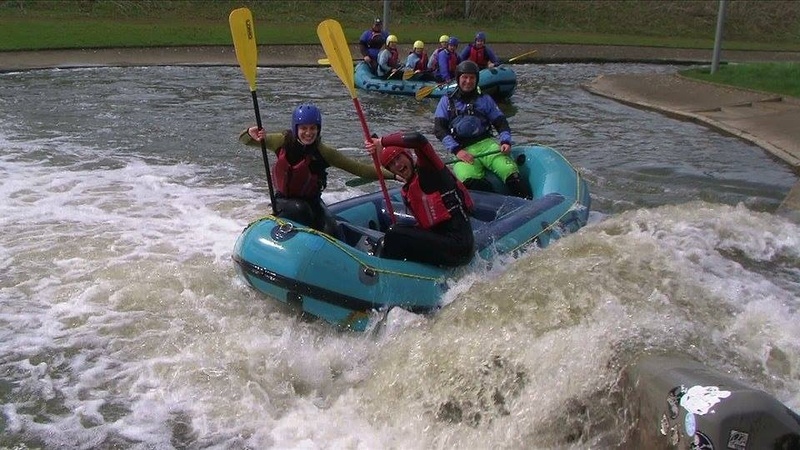 Participants: The Private White Water Raft Charter in Northamptonshire is for 6 participants. Up to six people per raft. Spectators are welcome, they will be able to see the whole session - but please note that viewing areas are not covered. All specialist equipment such as wetsuit, buoyancy aid and helmet will be provided by the centre. You should take your swim suit & towel, a spare pair of trainers and warm clothing to change into afterwards. Rafting operates in most conditions but may be affected by extreme weather conditions or flooding if the rivers are too swollen. Please check with the centre on the day or the day before your experience.